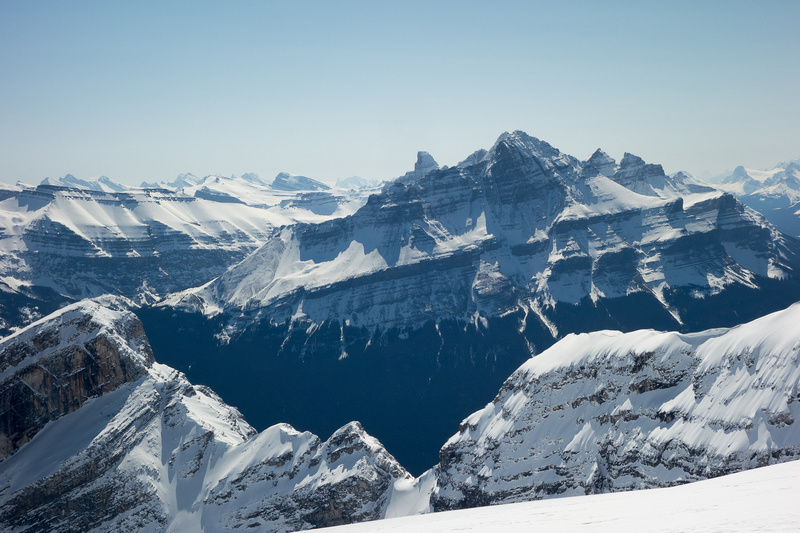 Mount Wilson has been on my radar for a long time already, ever since one of my first trips up the Icefields Parkway with Sonny back in 2006 when we ascended Sunwapta Peak. 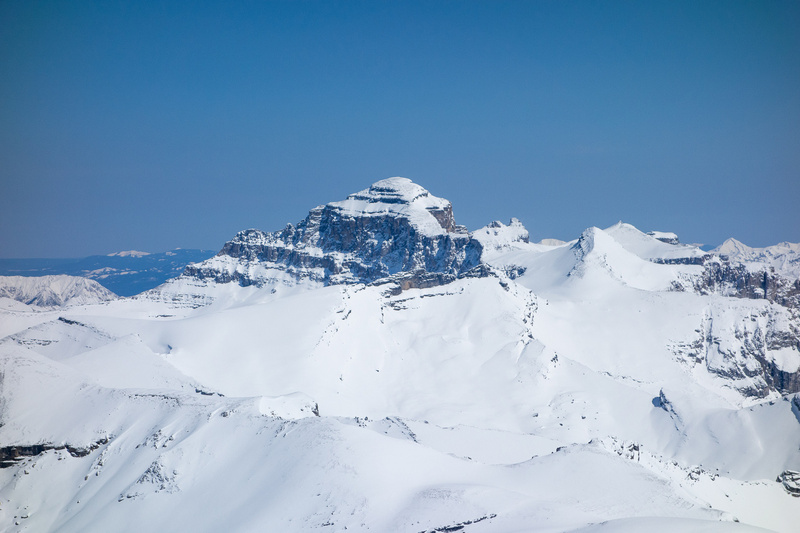 On the way home we drove past this massive mountain sitting just north of Saskatchewan Crossing and I remember thinking that it must take some effort to stand on that summit! It turns out that it does take some effort! 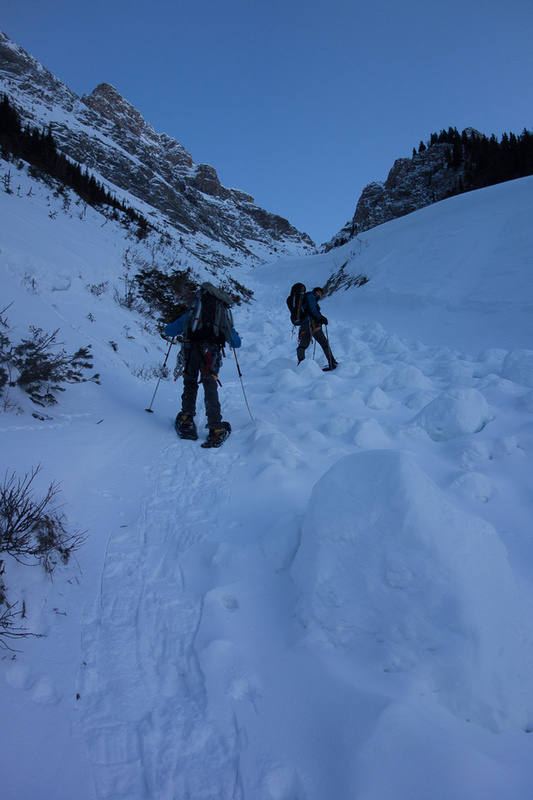 After ascending Big Bend Peak and Mount Saskatchewan Junior the day before, it was a challenge to wake up at 03:00 on Monday morning but we managed! I also never sleep well in huts / hostels and only got about 4 hours per night. After consuming a proper breakfast of bacon, dutch cheese and a toasted bagel (I love staying in places with proper kitchens) I felt ready to tackle the day. Mount Wilson catches the last rays of sun the night before we climb it (from the other side). Named by J. Norman Collie in 1898. 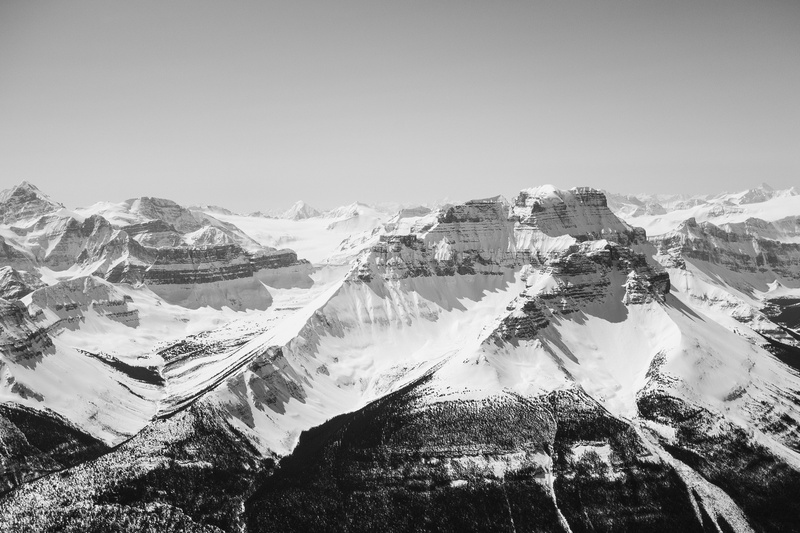 Wilson, Tom (Tom Wilson was an early explorer, outfitter, and guide in the Canadian Rockies.) (see biog.) Official name. First ascended in 1902 by James Outram, guided by Christian Kaufmann. Steven and Ben could break trail. 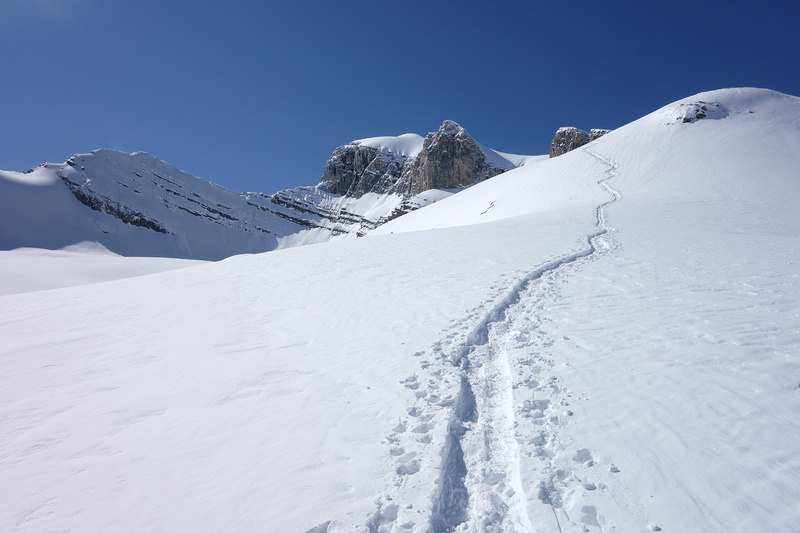 Their snowshoe track would be much too steep to follow on skis and with Eric on his 4th ascent of the year, he told me I’d be breaking trail most of the ascent if we ski’d. Eric had a hard time fitting his skis in Steven’s small car. As it is, I’m surprised they all fit in there. 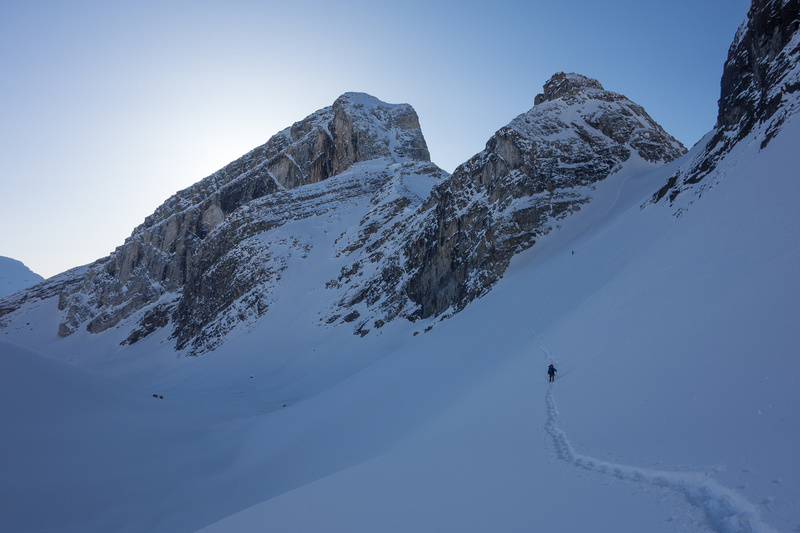 Around 1000 vertical meters of gain (and loss) on Wilson is spent with the skis on your back. 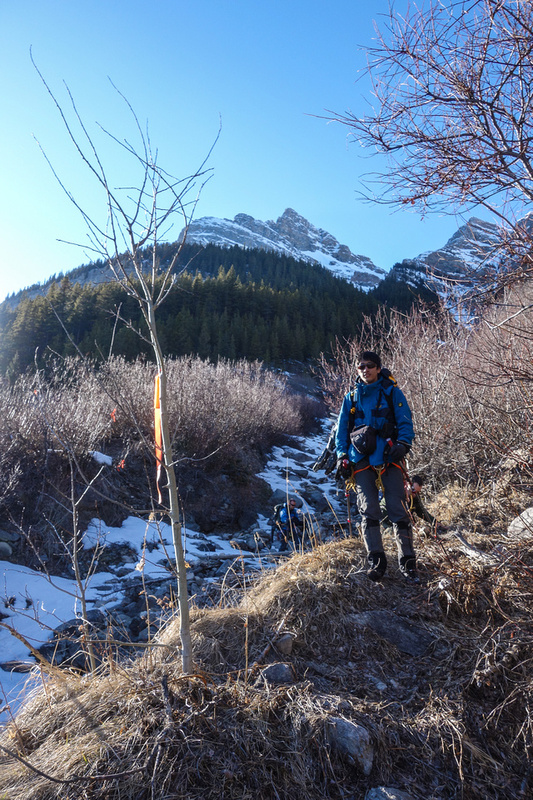 I simply didn’t feel like carrying my skis through thick bush in the dark (no snow in the trees) and then all the way up (and down) hard avy debris in the gully. 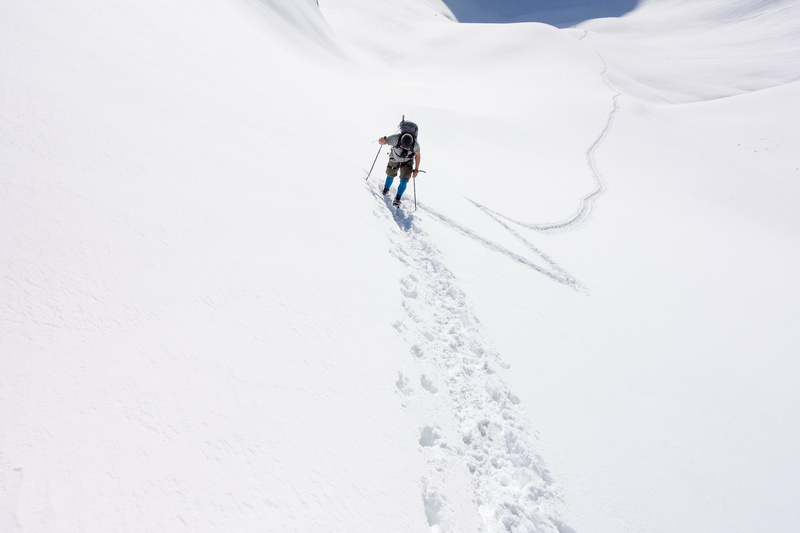 Snowshoes have built-in crampons which is very handy, especially as we were considering that with the cold weather we’d have hard snow in spots. 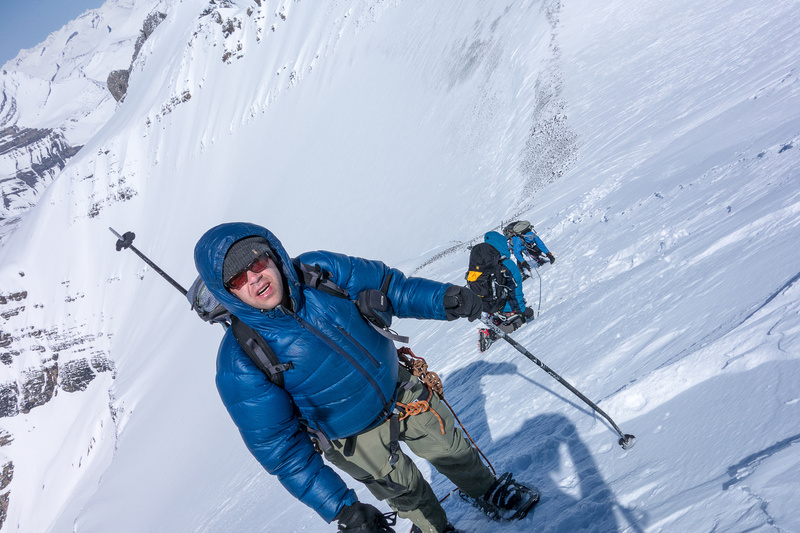 I could wear my mountaineering boots instead of tramping up 1000 meters in ski boots! We would make what normally was a 2 day trip into a 1 day trip by utilizing the short cut route described (with an error on the summit line) in Chic Scotts book. Obviously we were starting in the dark and had problems right away with the “gravel pullout” on highway 11 just off hwy 93. It’s about 300 meters past the turn off and is marked with a line of boulders that prevent you from driving onto either of the two roads going into the bush – one goes west and the other east. We took the west one in the dark, not even realizing there was an east one! 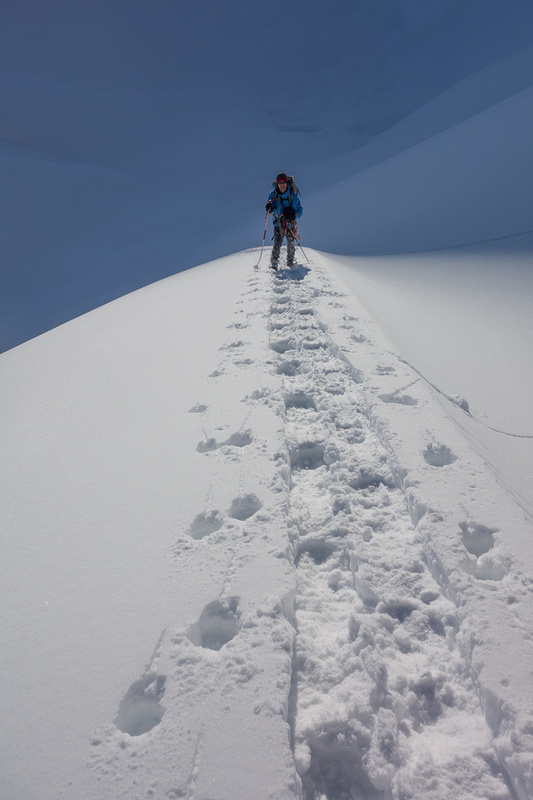 It’s better to take the east one and then once it goes in about 200 meters just go straight for the avy ascent gully. Taking the west one orients you in the exact wrong direction and you can only use it for about 100 meters before doing a right hand turn into the bush. Our GPS Track seen on Google Earth. The first hour or so we spent in the dark, thrashing through fairly dense bush and trying to follow an erratic GPS signal to the ascent gully. Amazingly we actually ended up in the correct creek bed! 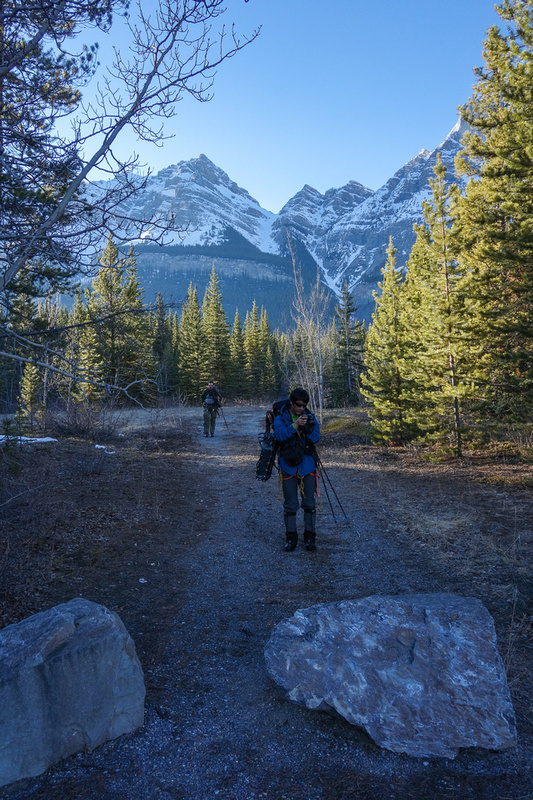 Don’t underestimate the approach through the bush – especially in the dark. It’s not really thick bush but it’s bad enough. We had barely any snow until the gully and kept the ‘shoes on the packs. Once in the gully we put the ‘shoes on pretty quick to assist with the climbing on hard snow. 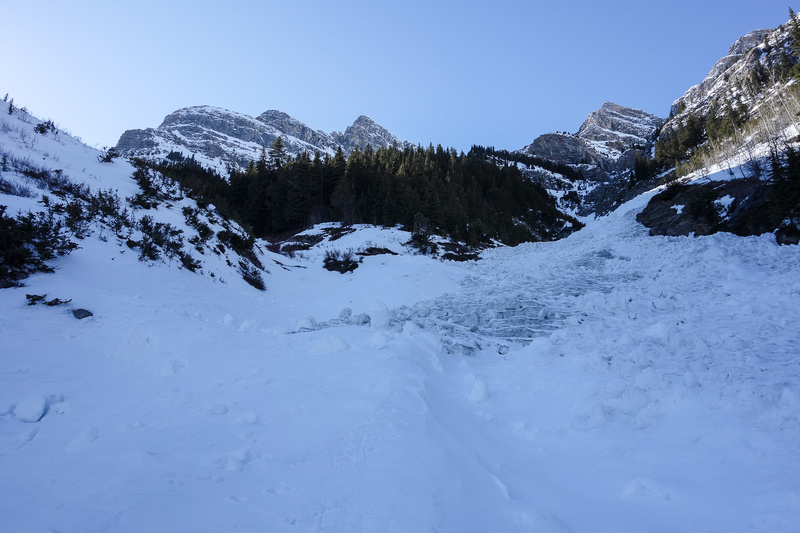 Soon we encountered old avy debris and the traveling got a bit tougher. The sky was getting lighter and we enjoyed the views of Murchison, Chephren, White Pyramid, Epaulette, Kaufmann Peaks and Sarbach. 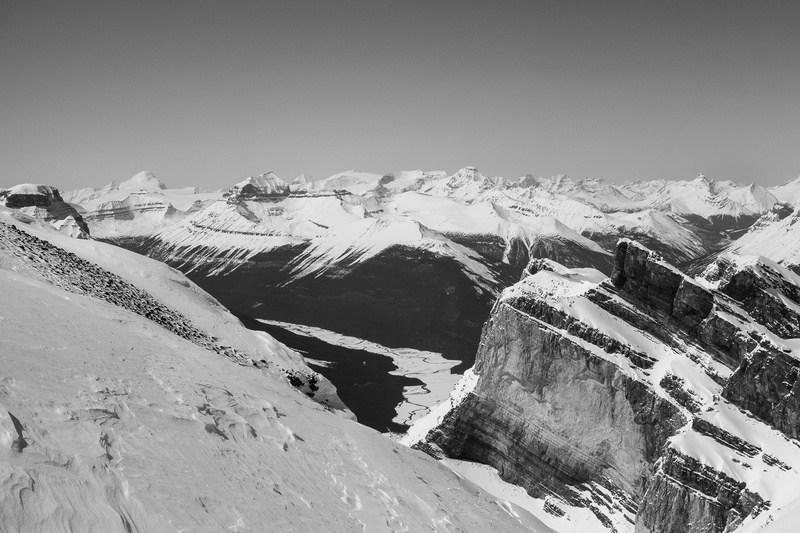 There a few good things about the ascent gully on Wilson and the views that open up to the south is one of them. The other is how quickly you gain height. 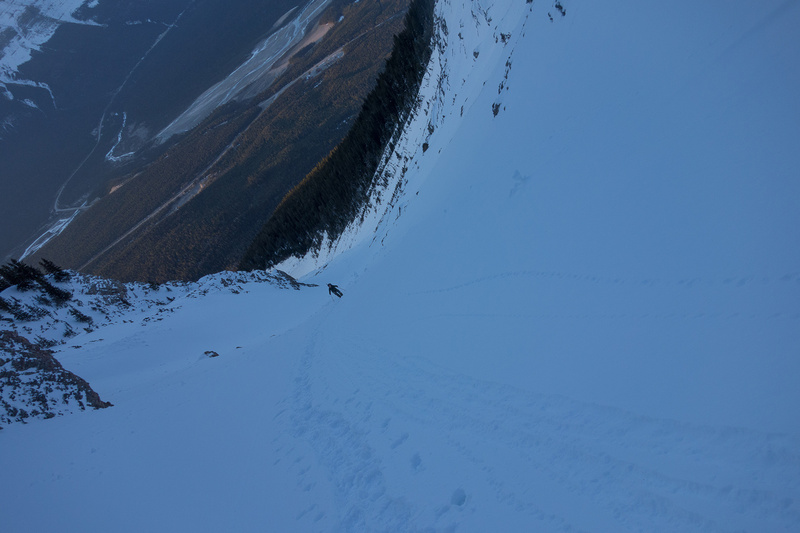 It was pretty dark when we started up the avy gully. Now imagine how dark it was in the trees before we got to the darn gully!! 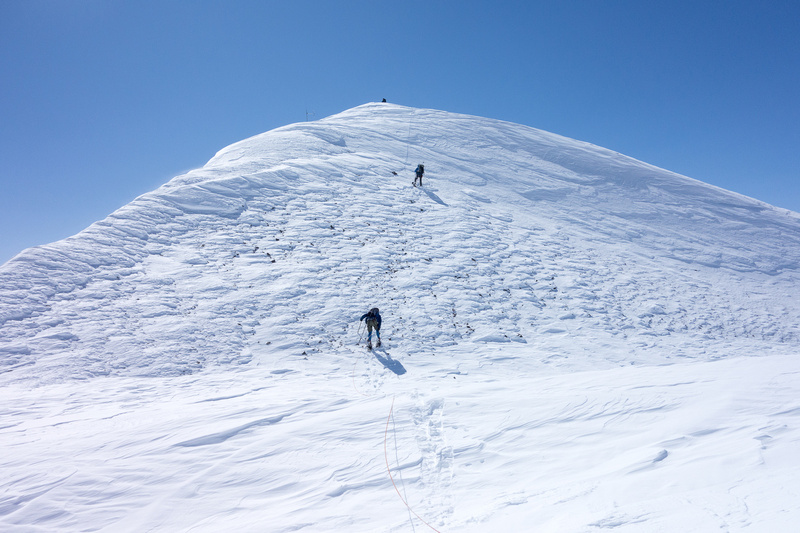 Our most impressive feat of the day was finding the ascent gully. Everything after that was gravy. The correct, left branch of the gully isn’t nearly as obvious as we thought it’d be. We had a discussion about whether to continue up the main branch or not and voted 3 to 4 that we’d better take the left branch. Be prepared to question the branch – it looks like it ends in forest but really doesn’t. It heads left and then curves sharply right once you’re in it. Basically take the very first left that you can as long as it’s a gully. 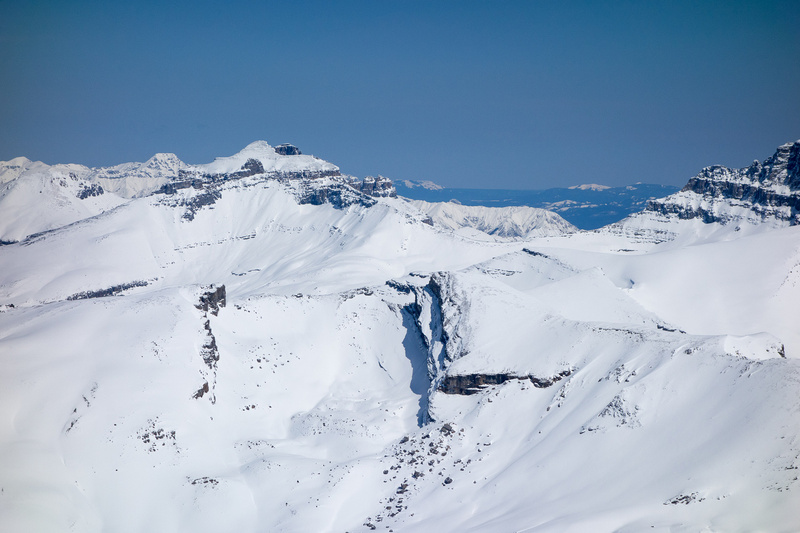 It should have avy debris in it – if it doesn’t I would avoid it like the plague unless it’s summer or fall. We followed the left branch as it got steeper and steeper. We managed to avoid the really chunky debris by sticking on the edges. 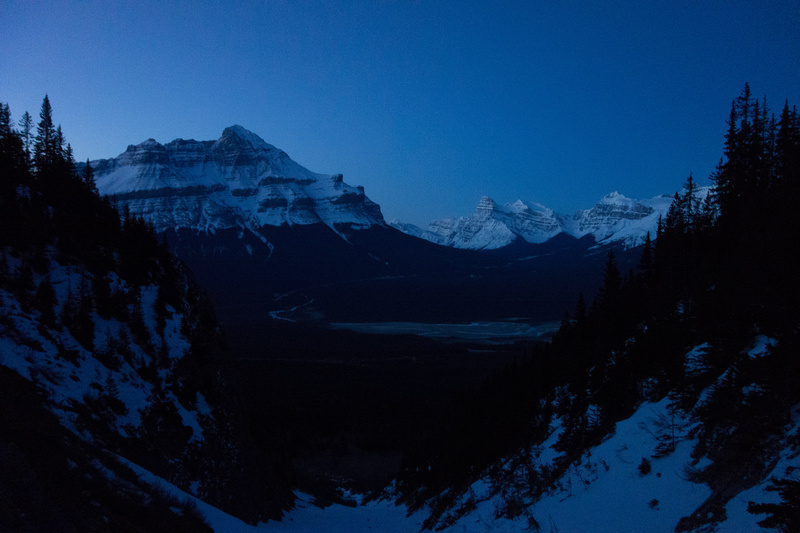 The views were really starting to open up behind us with the first sunlight hitting the high peaks. 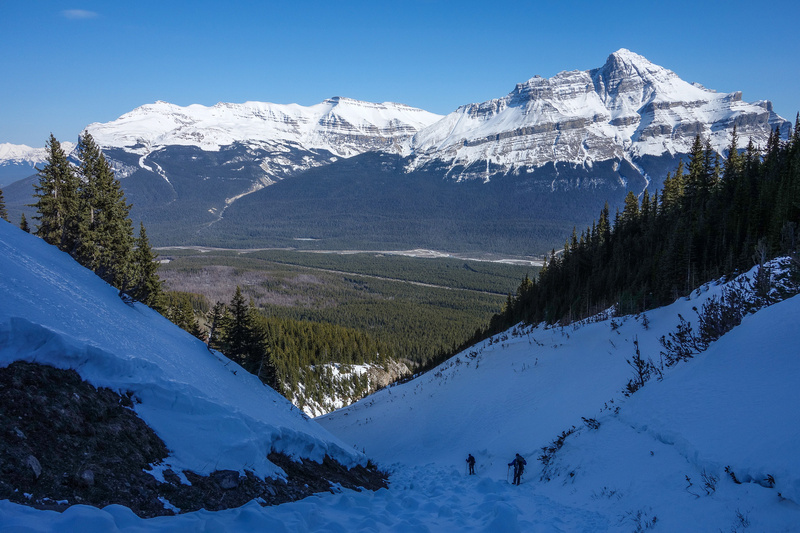 I was super glad I didn’t have my skis along – I’m sure I would have been exhausted already from carrying them through the bush and up this steep slope while kicking steps in ski boots. 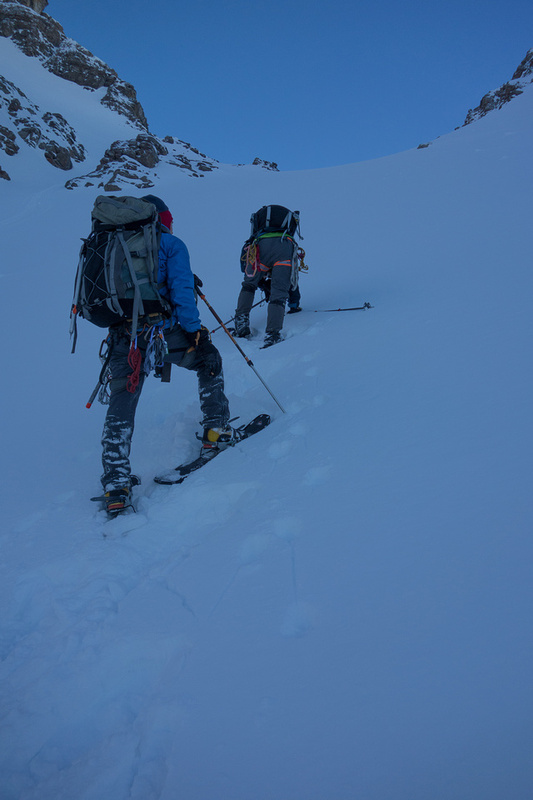 The crampons on my MSR Ascents worked beautifully on the hard avy slopes. 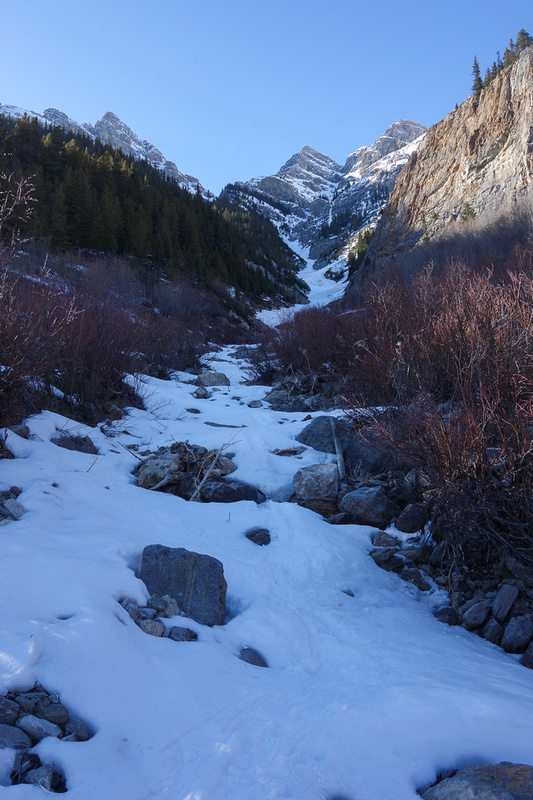 The gully gets steeper and steeper until you reach the col. If it hasn’t slid recently I wouldn’t be caught in here. Eric in the ascent gully with Murchison rising at left. 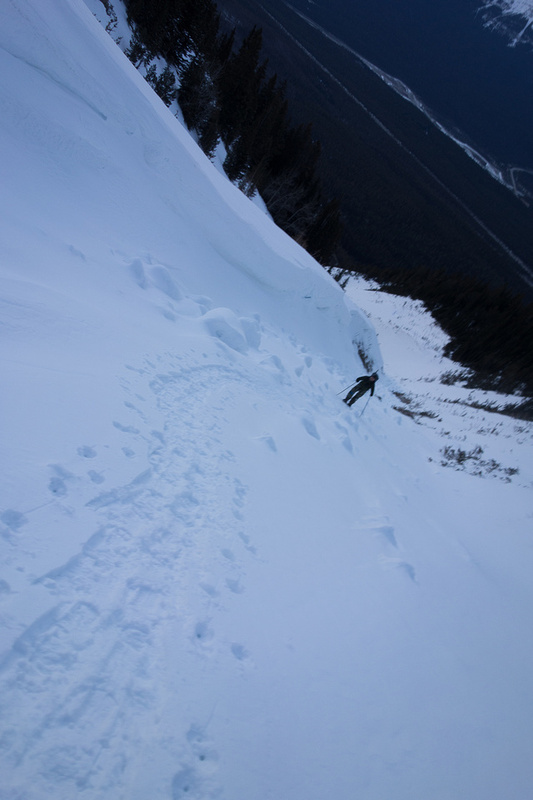 There are many things you shouldn’t underestimate on Wilson and the avalanche ascent gully is another. It’s long. It’s steep. It’s dangerous. 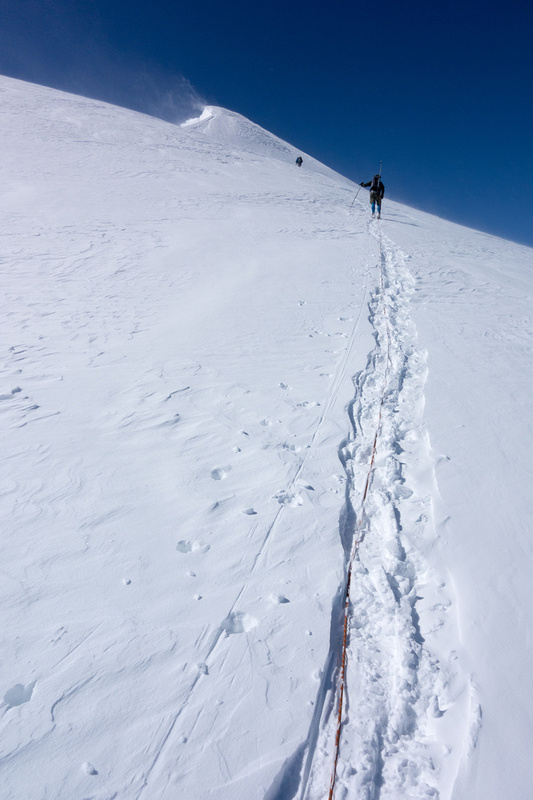 As we worked our way into the final slopes beneath the col the view became very foreshortened. In a common theme for the day, Steven emphatically declared that we’d be at the col in “30 minutes”. 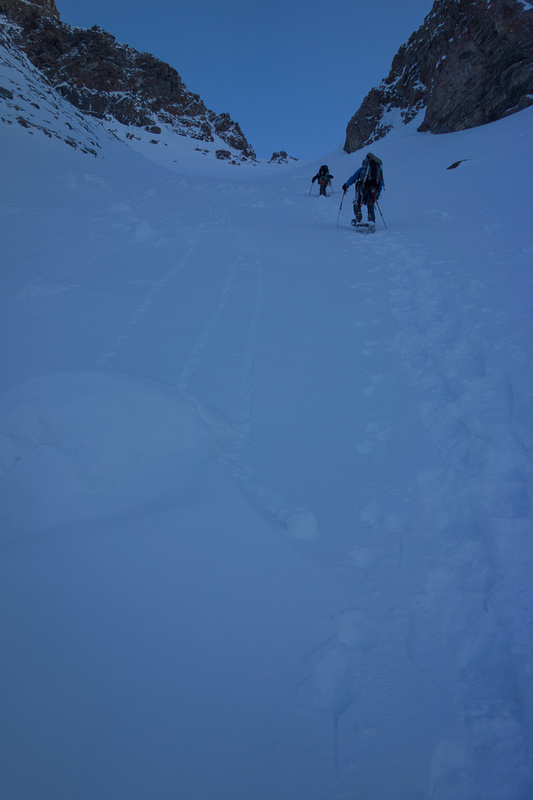 The snow in the upper avy bowl was sun crust with sugar and Steven and Ben did a great job trying to kick steps up it. Eventually we gave up and started switch backing just so the ‘shoes could get some traction. 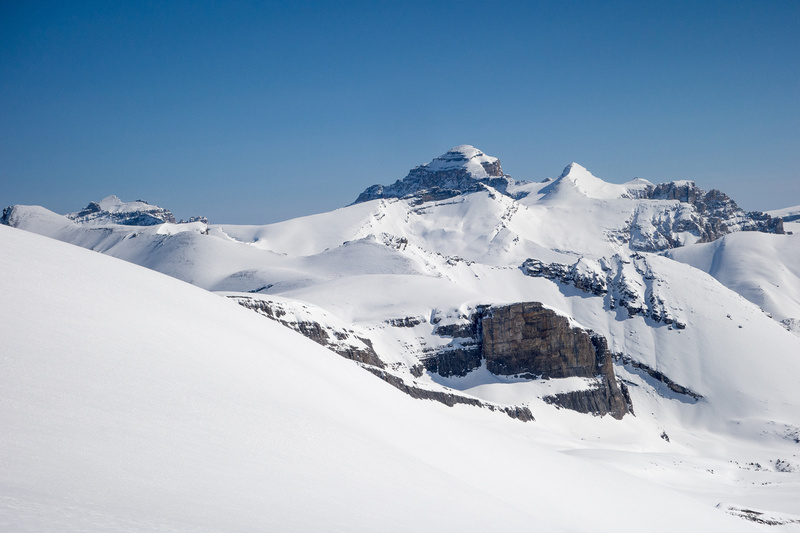 An hour later we finally hauled ourselves up to stunning views of the Wilson massif and it’s gorgeous ice field. This is what we came for!! The incredible Wilson ice field with almost the whole route visible. Around the first cliff bands on climber’s left, than around the next line of cliffs on climber’s right. Contour around the upper slopes to the summit col (out of sight here) and then back climber’s left to the summit (true summit out of sight here). The slopes are north facing and never get sun. The snow was bomber, almost too hard with a few cm’s of fresh snow on top, our snowshoes wanted to slide us all the way down the slope a few times! This was the scary part for me – feeling a bit insecure on the ‘shoes. 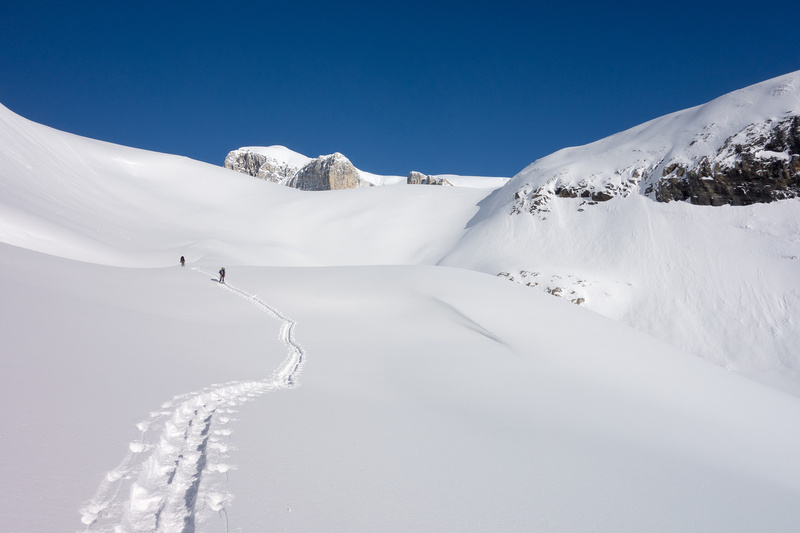 Skis would have been impossible here, maybe crampons would have helped but I wouldn’t be on this slope with skis. 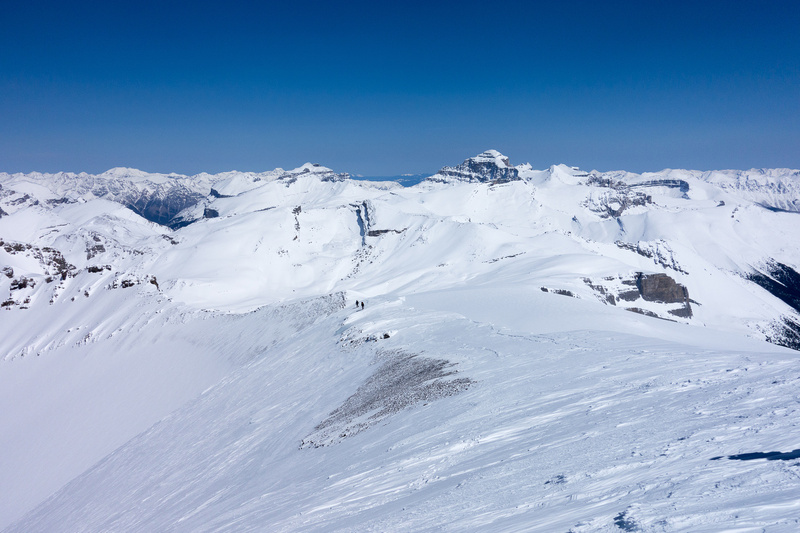 The slopes get bombed with cornice collapses from above which makes them even safer (as long as the cornices are gone – which they mostly were). 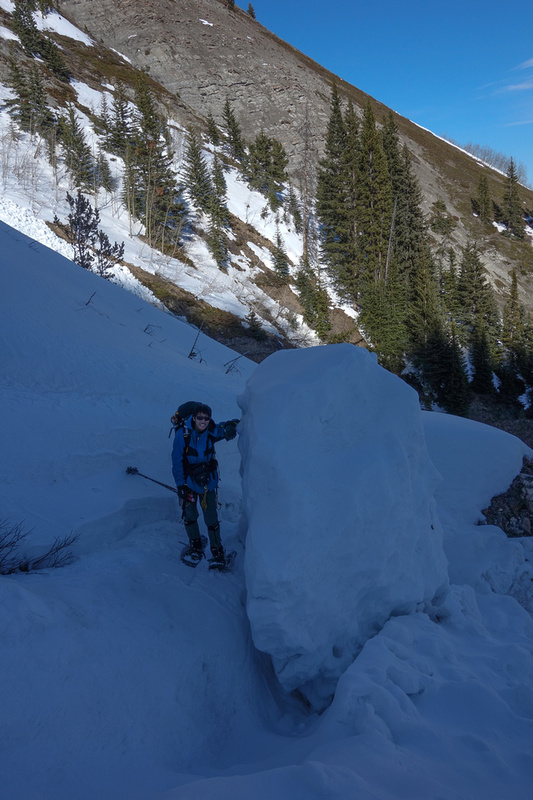 We saw a few avalanches coming off the ridge above the slopes and they never crossed our path either. We didn’t linger on the slopes after the col and I breathed a bit easier when we were done that section – I wasn’t sure how I’d feel doing them again at the end of the day but that was a long way off at this point. We took a nice break in the first direct sun of the day before continuing on. 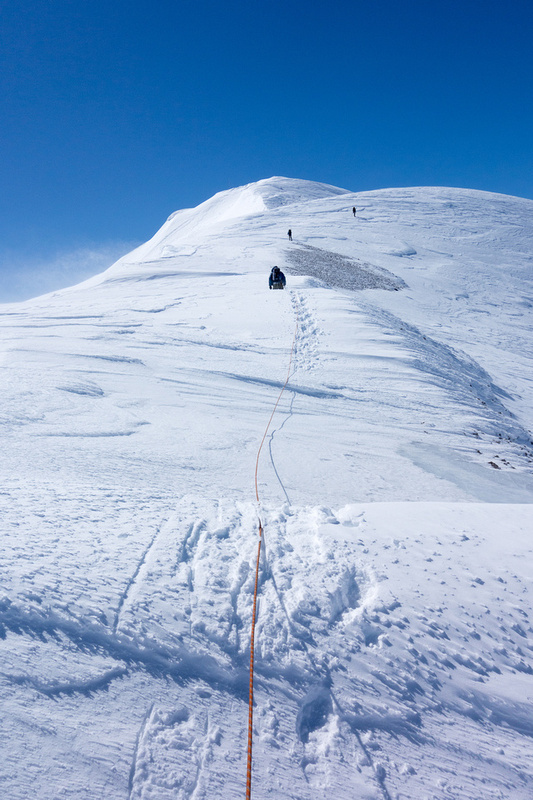 We didn’t have any firm beta to go on for accessing the upper mountain, but assumed from some online trip reports that we needed to traverse northwest, over the first obvious ridge and then either directly beneath the summit block (crevasses) or in a wider loop climber’s right and then left to a col northeast of the summit. 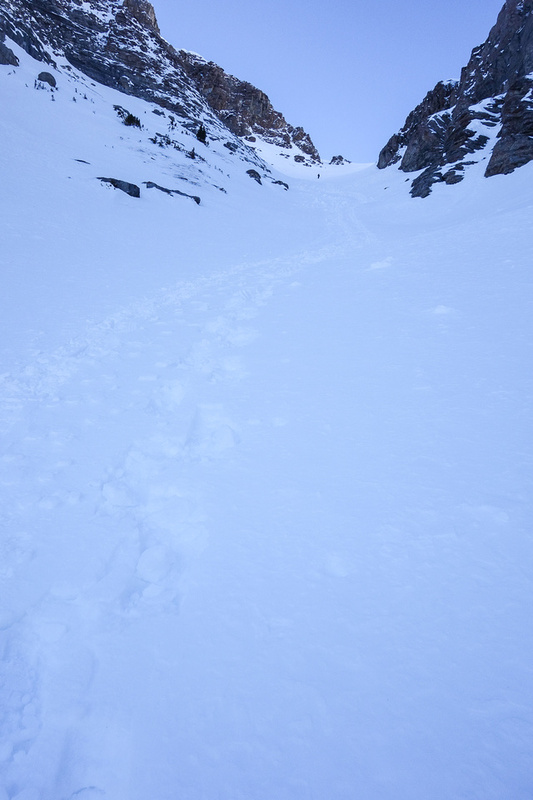 See our tracks coming from the col which is now below us again at center. 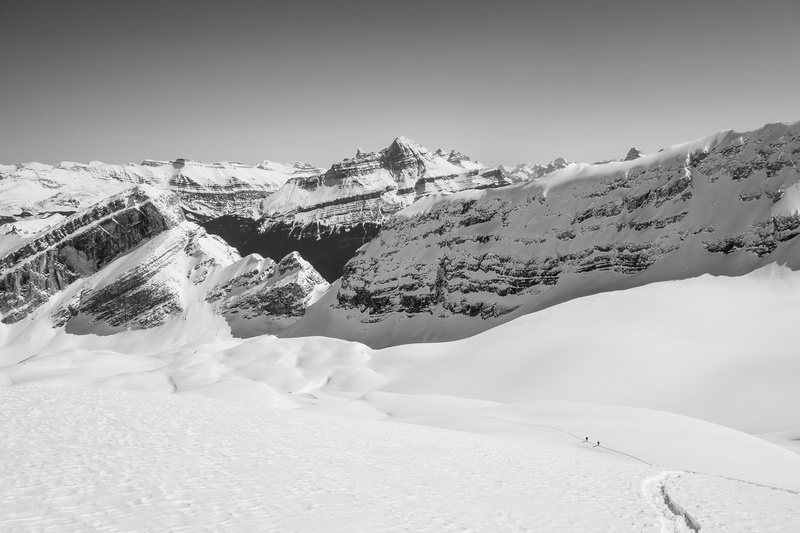 Making our way up to the icefield. We don’t have the rope on yet as we’re not on the glacier here. An avalanche comes off the south ridge over our tracks from the col. It’s not as bad as it looks though – the trail basically just got dusted as it’s still a way off the cliffs. 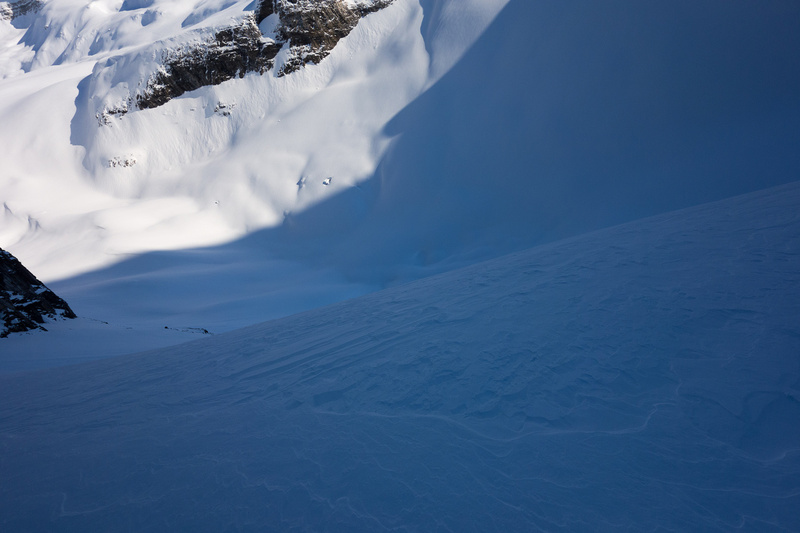 Bigger and more cornices would be more of a concern on our route. Conditions on the ice field were pretty good. We had up to about 4″ of penetration (!) on top of a firm base. Again, Ben and Steven were the heroes of the day, breaking trail the whole way for Eric and I. 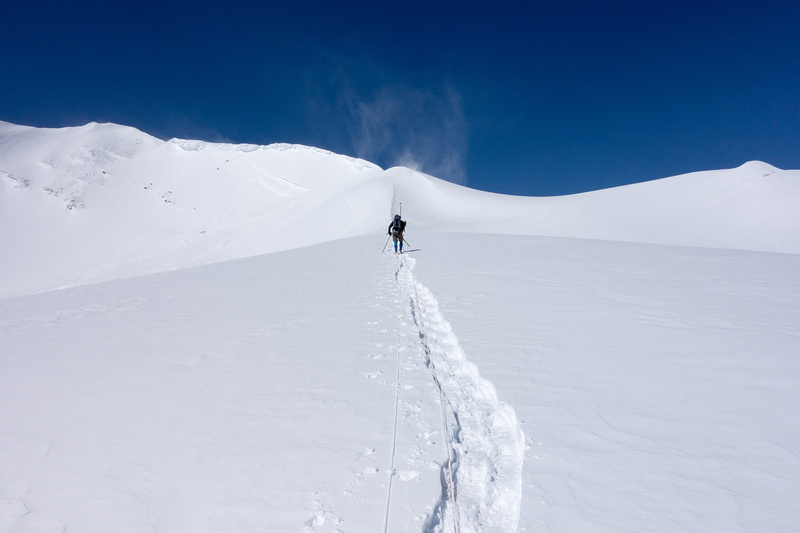 We took a very nice line and other than a few very steep rolls (south facing with crappy snow) we stayed off avy slopes and avoided crevasses to the col. We had two ropes and put tons of space (i.e. the whole 30m rope) between us. If one team had a member fall in anything, the other team was the rescue group. There were other configurations we could have done but each one was a compromise. Our general line was up to the right of the line of three cliffs coming off a false summit and between two gaping holes to the east of them. From there we took a nice slow-rising line around to the east and then north and then back west to the col. 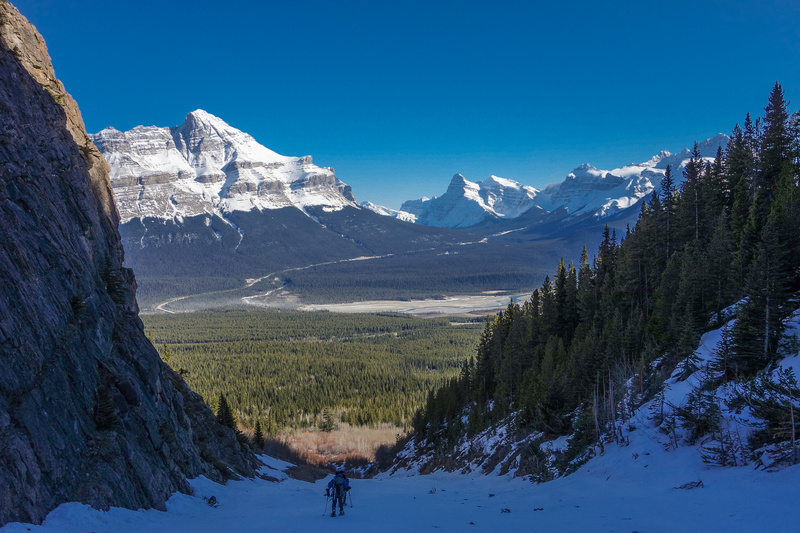 This avoided steep slopes and crevassed areas under the summit block and gave us stunning views towards David Thompson country and Mount Cline. 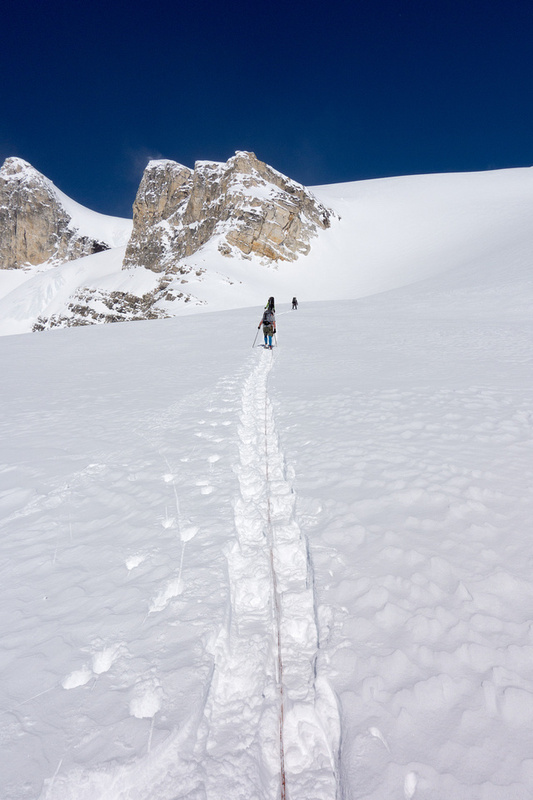 Ropes are on as we continue up the large icefield towards the summit ridge. As we gained the high col on Wilson the wind became stronger and much colder. We’d been in t-shirts and all of a sudden we found ourselves layering up in 2 or 3 layers to keep out the biting west wind. 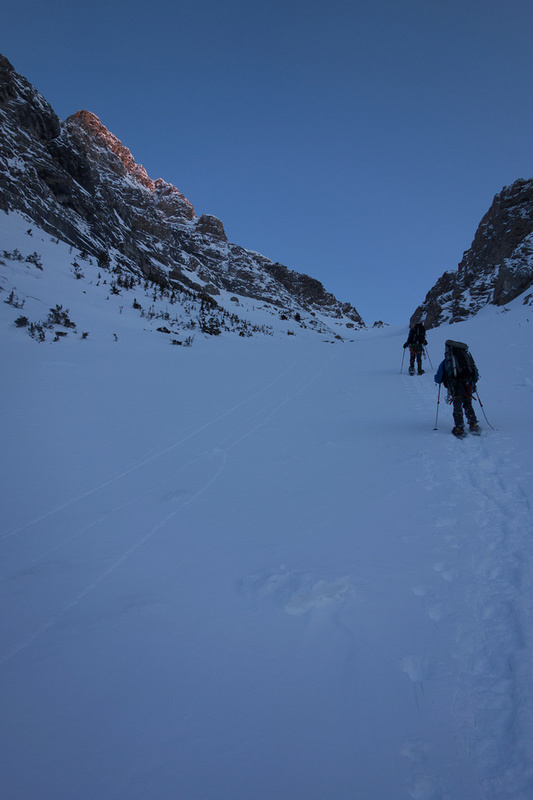 At first glance the crux didn’t look too bad and 3 of us kept our snowshoes on for it. Steven was the wise one and put his crampons on. I’d forgotten mine so didn’t have that option. I won’t be forgetting them again, as the crux felt very dicey on ‘shoes. Getting close now! Not as close as you’d think, but still close.. We could have gone straight up the wind scoop but we played safe and took slopes to climber’s right just in case there were crevasses near the scoop. Summit is out of sight to the left here. 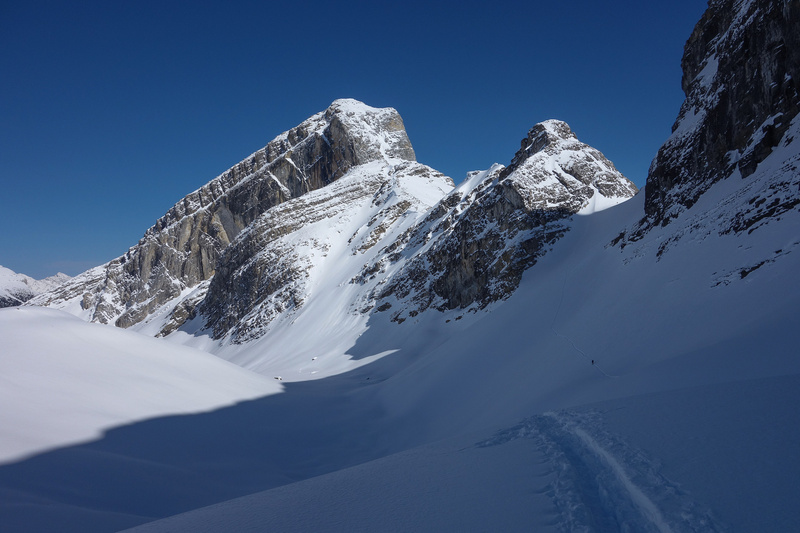 We knew from Josee’s trip report that we had to go climber’s right around a crevasse on the steep roll that access the upper summit block, We barely went far enough right! Ben found a pretty deep and scary looking hole when he put one foot in it and hastily backed off! Keep in mind that we were freezing in the very cold and strong summit winds at this point – I could barely feel my fingers and my face was falling off. Falling in that crevasse would be most uncool. I don’t think this was the same one Josee fell in – this one was narrow enough to wedge you in really tight and looked very deep. I think it was also a bit further up the slope but I’m not sure. 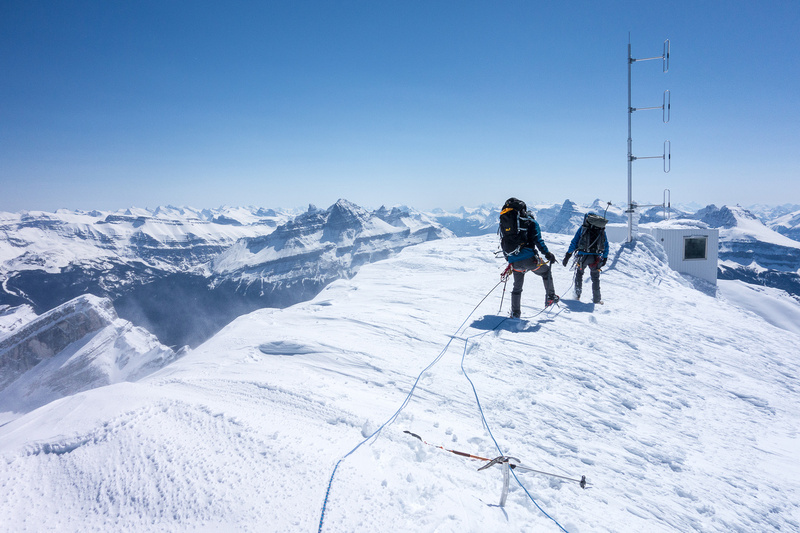 In any case, to avoid crevasses on the summit ridge, go as far climber’s right as possible (rocks here at the beginning, stay just left) before trending towards the cornices. 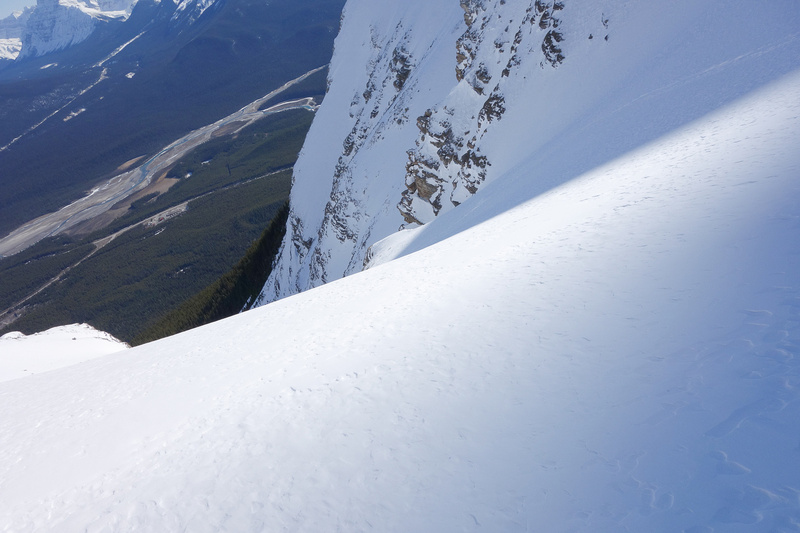 This will be harder than it sounds because staying right means being on a snow slope that takes you off a cliff and 2km down to hwy #93 – so you won’t want to go too far climber’s right either! Heading up to steep slopes to the summit. 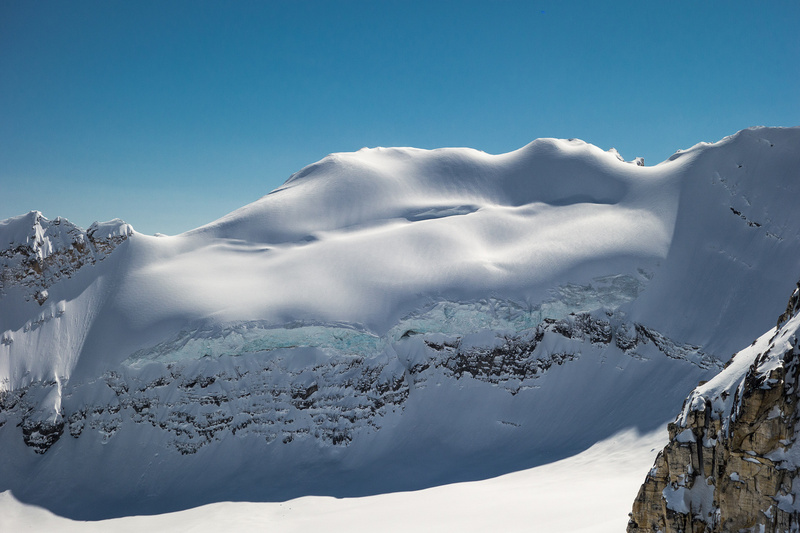 There are crevasse and cornice issues here. 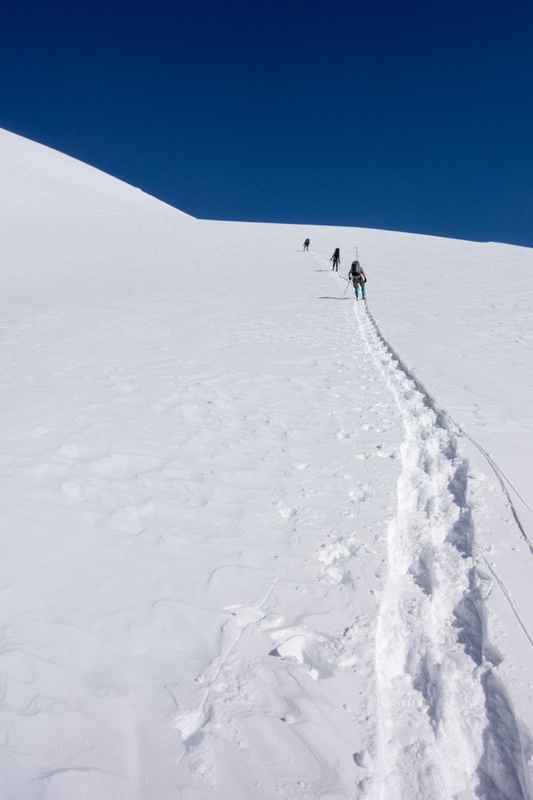 I wished I had crampons on the hard wind-packed snow. Done the steep bit! Now it’s a plod to the top. The terrain from the col to the summit of Wilson was a bit more technical than I was expecting. If you go straight up you’ll fall in a crevasse. If you go too far left you’ll punch through or trigger a massive cornice failure. If you go too far right you’ll slip on hard pack, or slide on loose snow down to hwy #93! 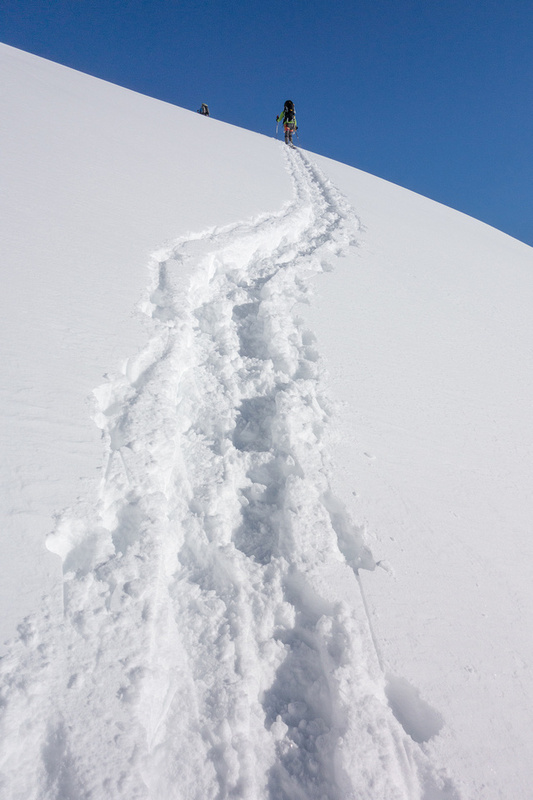 Especially in snowshoes, I found this section a bit dicey. Since we were roped I knew that if Eric or I slipped we were both going for a ride off Wilson’s west face. Short roping this section and even protecting it with snow stakes is not a bad idea. The slope is so wind blasted we could barely get our axes in and had to treat it more like ice than snow. 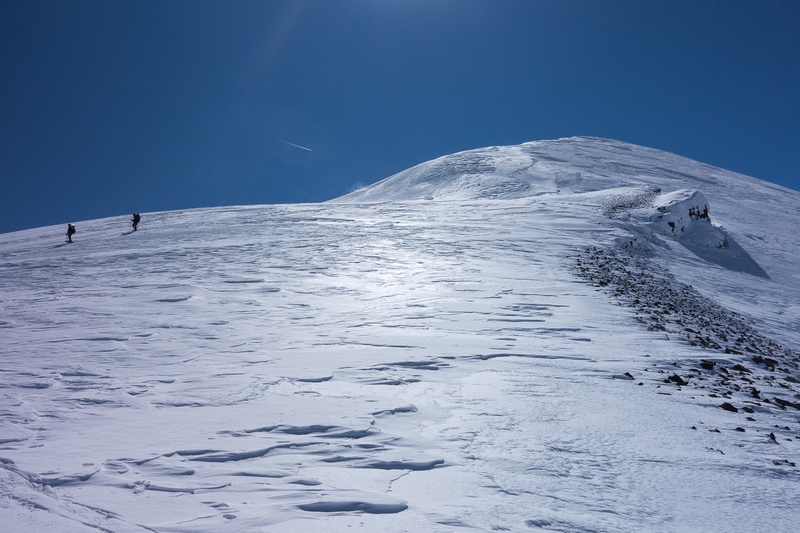 When we got off the steep expose slope, we were left with a very steep scramble up loose rock / snow to the summit. On top! I didn’t realize there was a structure up here. Murchison at center distance with Corona Ridge to its left. Cline and Resolute on the left and Murchison on the right with David Thompson Country in between including Corona Ridge at center right. 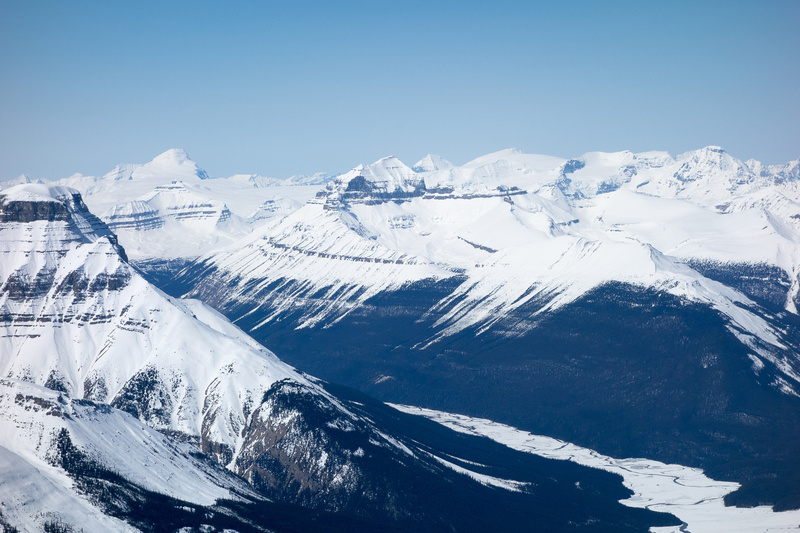 Views west include many of the ice fields peaks and 11000ers including Forbes, the Lyells, Bryce and Columbia. 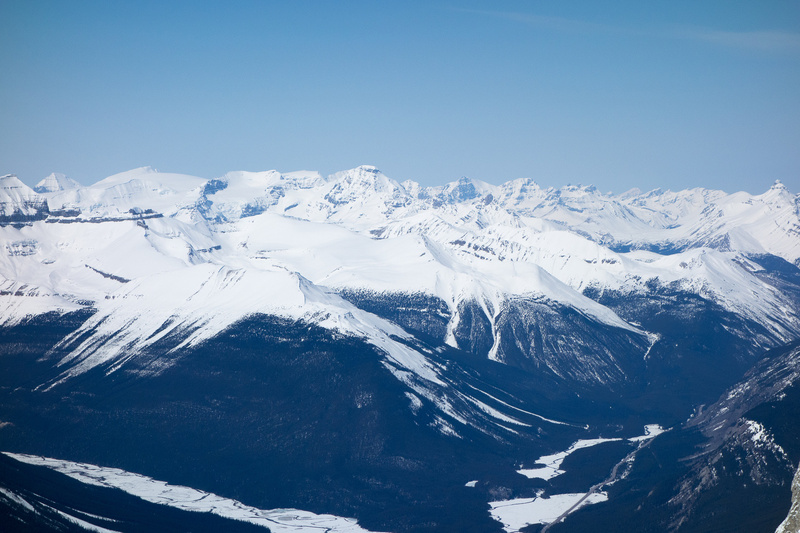 From L to R major valleys are the Glacier River, Arctomys Creek (Valley of a Thousand Lakes) and the Alexandra River at center. Descending the summit looking west off the steep snow slopes towards Amery. Mount Columbia at distant right. After the summit block everything back to the shortcut col was gravy. We descended our gradual up-track with gorgeous views in all directions. 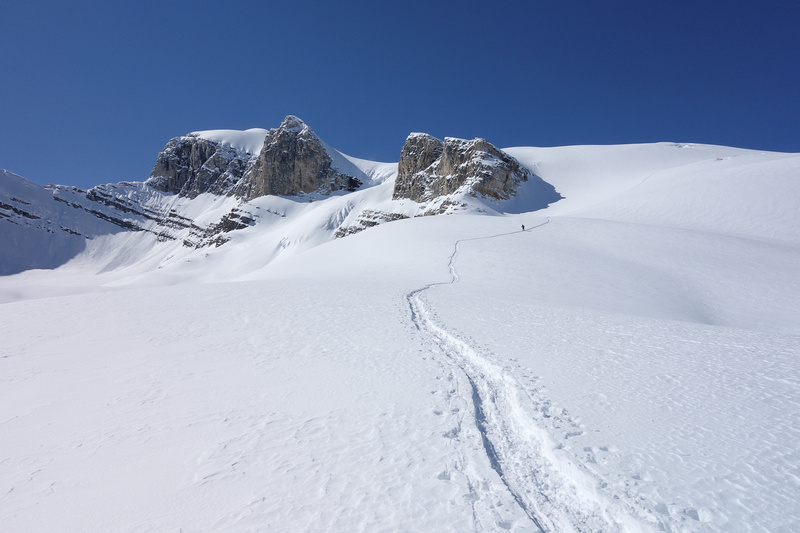 The traverse across steep slopes and up to the col was firmed up from the morning and actually felt a bit safer (probably because I was comparing it to the summit block) and we powered our way up to the col entirely on snowshoes! The trick is to kick them into the snow as if you’re wearing boots – it works pretty good provided the snow is soft enough. 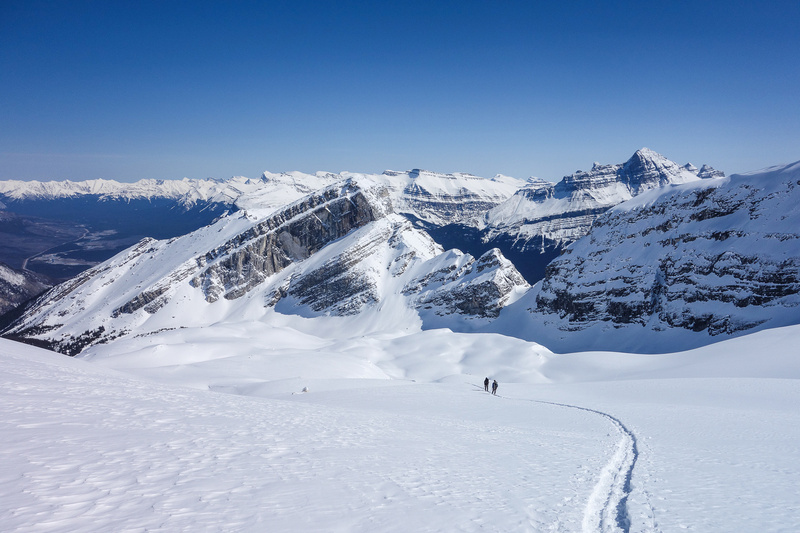 Descending the large icefield on Wilson – looking straight down Owen Creek towards the David Thompson Corridor and North Saskatchewan River. Returning to the scary-steep ascent back up to our escape col. The descent down the south facing avy slope was relatively safe since the sun was off it for over an hour by the time we got to it. It felt like a long descent but eventually we were back in the trees for the ‘pleasant’ bushwhack to our cars. My GPS performed wonderfully again and we ended up coming out of the east branch of the approach roads – the one we missed in the morning. 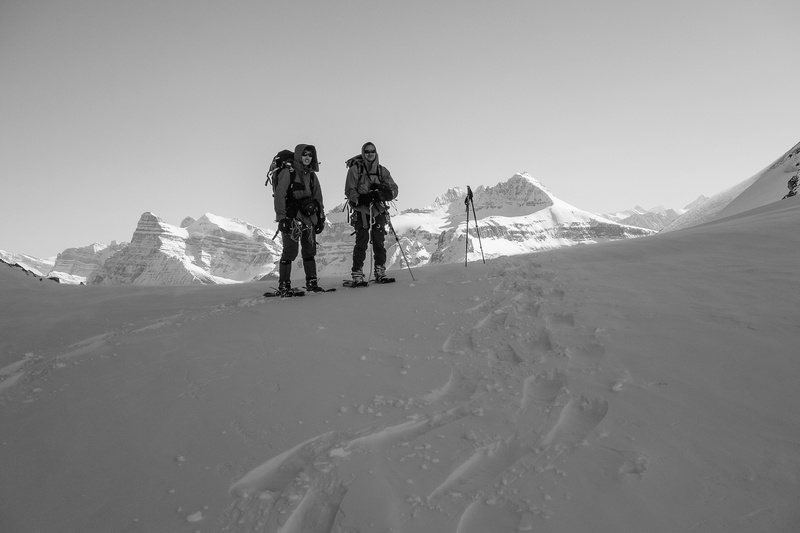 Eric looks pretty small in the lengthening shadows as we reascend the col.
Wilson proved a very worthwhile mountain to pursue despite the risks. 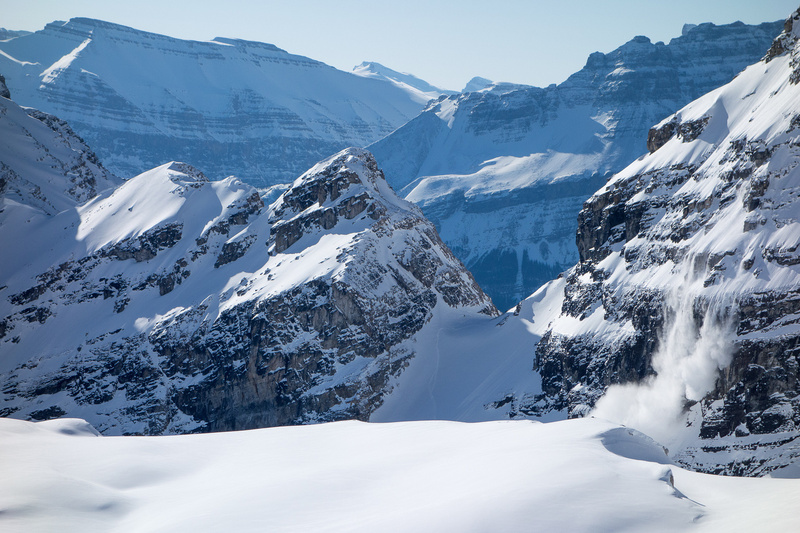 It has stunning views, an amazing snow climb and some semi-technical snow terrain to navigate at the summit block. Not much more to ask for in a mountain this size! 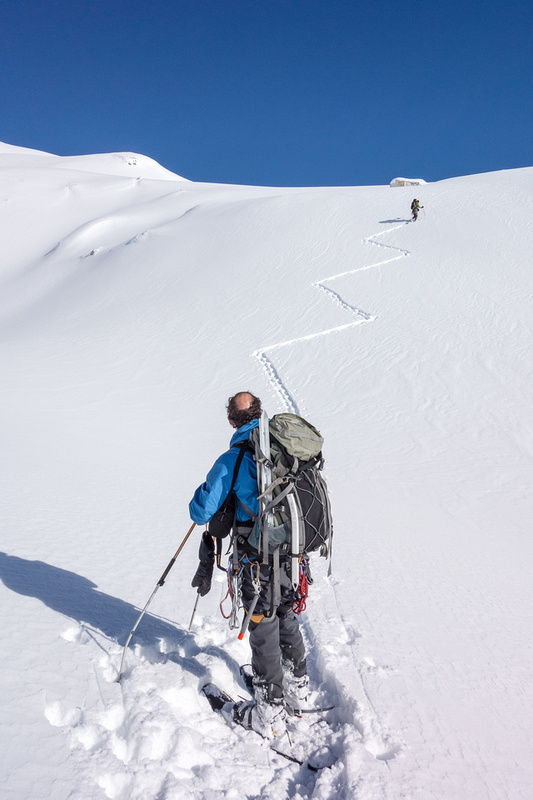 Be very sure of conditions and your ability to assess them before committing to this trip and please don’t follow my GPS track across the slopes from the col to the ice field unless you’re very sure it’s safe. 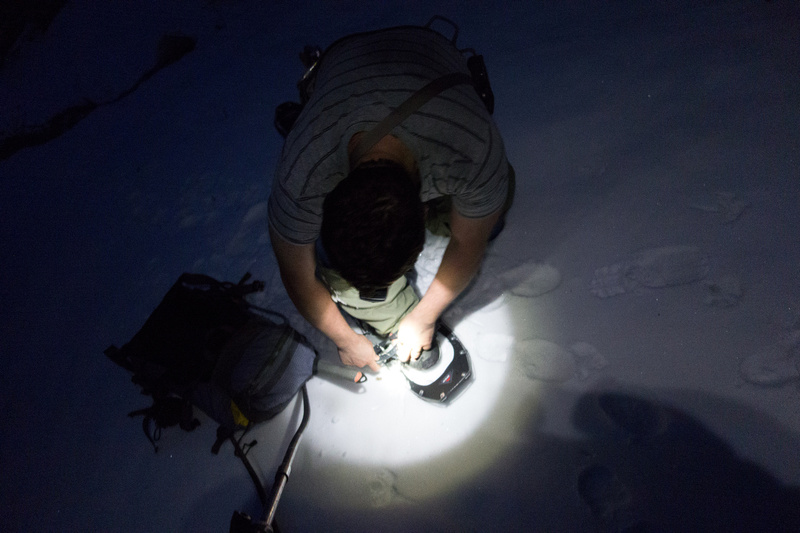 Putting on the snowshoes in the dark. 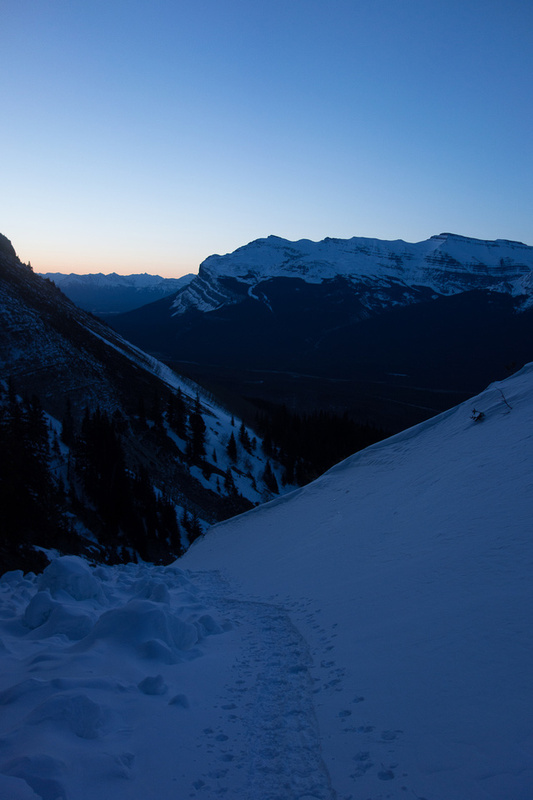 It was pretty dark when we started up the avy gully. Now imagine how dark it was in the trees before we got to the darn gully!! The ascent gully on Mount Wilson. Alpenglow on Murchison, Chephren, White Pyramid, Epaulette, Kaufmann Peaks and Sarbach. A nice view from the ascent gully. We're in the left branch now, looking down at Eric ascending behind me. 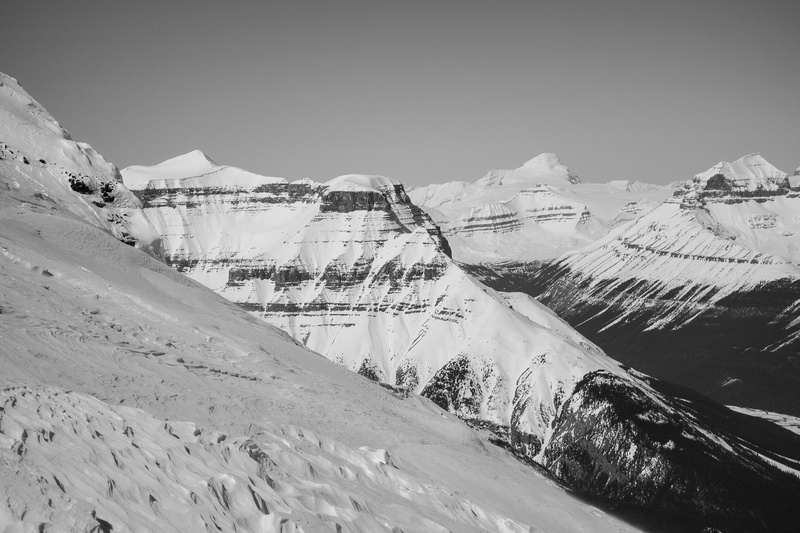 The gully gets steeper and steeper until you reach the col. If it hasn't slid recently I wouldn't be caught in here. Unless there's no snow of course! This is what we came for!! The incredible Wilson ice field with almost the whole route visible. 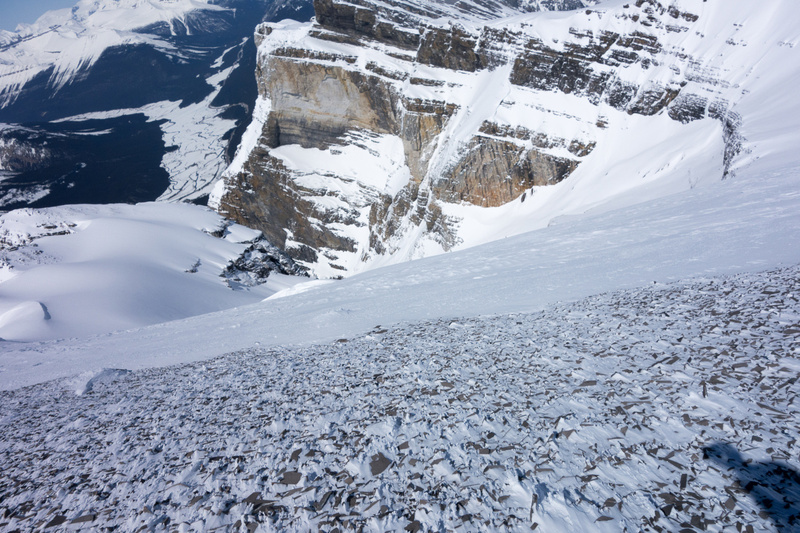 The scary drop over the col onto the Wilson Icefield. Thank goodness it's a north facing slope that never gets sun. Ben and Eric follow Steven and I down the steep slope from the col and across another steep slope to gain the icefields. Back up a nice arete on the ice field. 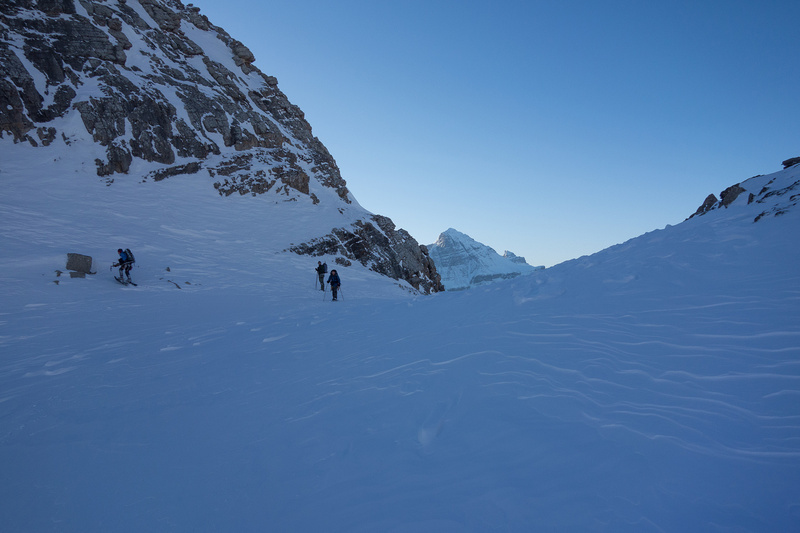 Making our way up the ice field. There were some fairly steep rolls that we had to watch out for, especially on descent as they were south facing. Eric comes up a steep roll. We weren't roped at this point since technically we weren't on the glacier yet - this is more of a snowfield than an ice field I guess. What a glorious day to be out on Wilson playing in the snow. Eric comes up behind me - you can see we're at the height of the col again. For some of the steeper rolls we went one-at-a-time to boost the safety factor in case of a small slide. Almost at the point where we roped up. Can you believe the weather?! Certainly worth taking a Monday off work for. 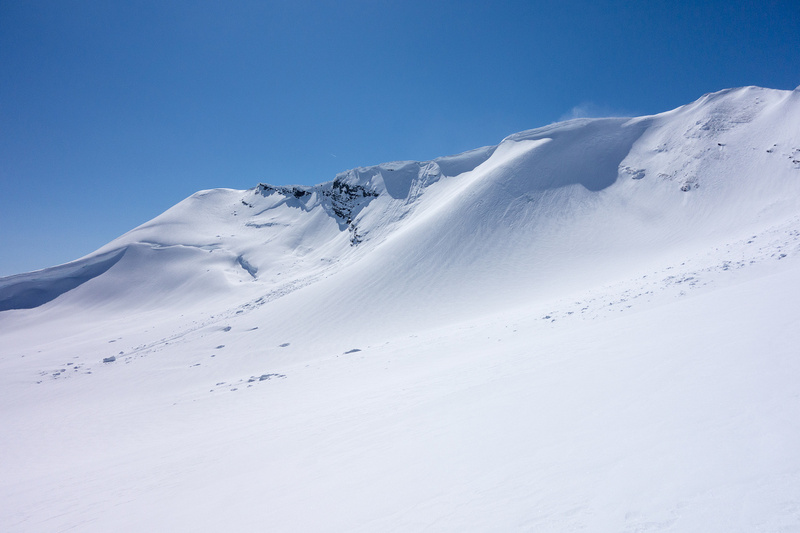 An avalanche comes off the south ridge over our tracks from the col.
Ropes are on and the terrain is still steep enough! 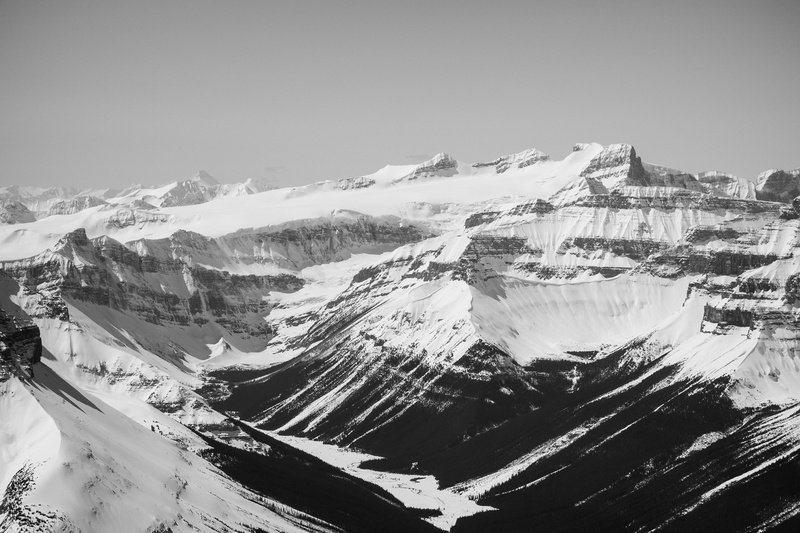 Cline on the left and the notch on the right with Murchison looming above. David Thompson Country in the background. Now we're much higher than the col. Murchison is an impressive mountain that's been calling my name for a few years already. Getting close now! Not as close as you'd think, but still close. Pano from the (cold!) col looking west. Click for full size. Heading up to steep slopes just before the summit. Nice views off the summit ridge towards Mount Columbia. Amery on the left with our bivy shoulder in between. Done the steep bit! Now it's a plod to the top. The summit is visible! One last scree / snow slope. 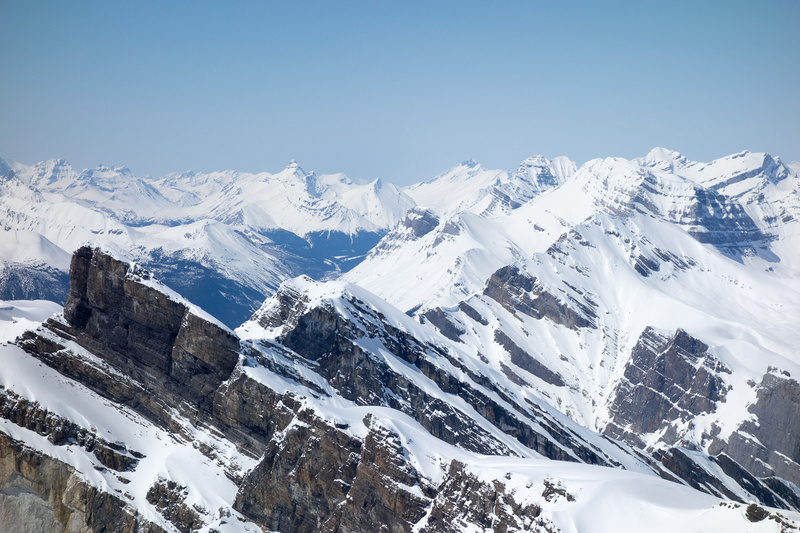 Summit pano includes many of the ice fields peaks and 11,00ers including Forbes, the Lyells, Bryce and Columbia. Made it! 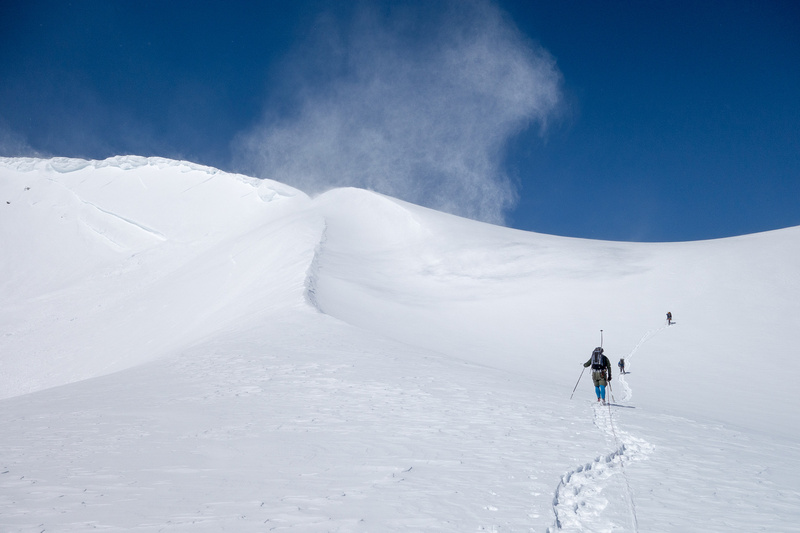 Note the wind whipping snow off the summit and blowing the rope. Resolute, Cline, Corona Ridge and Murchison from the summit. 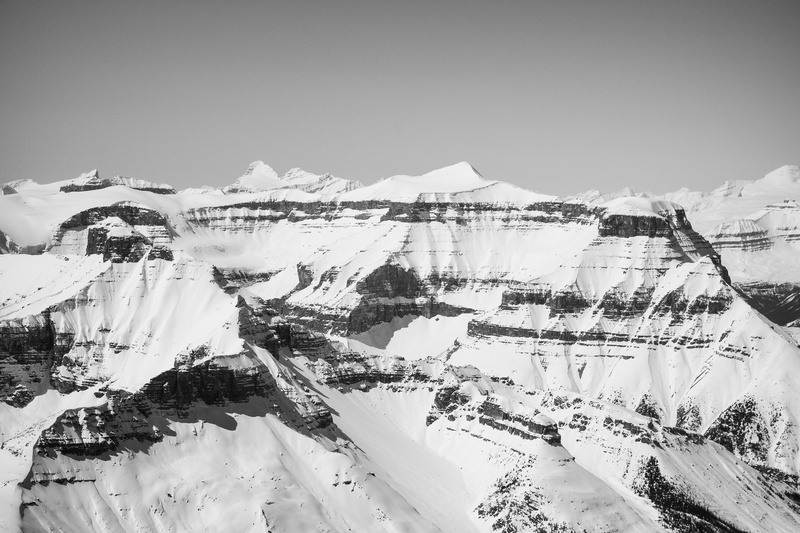 Mount Cline steals the show. 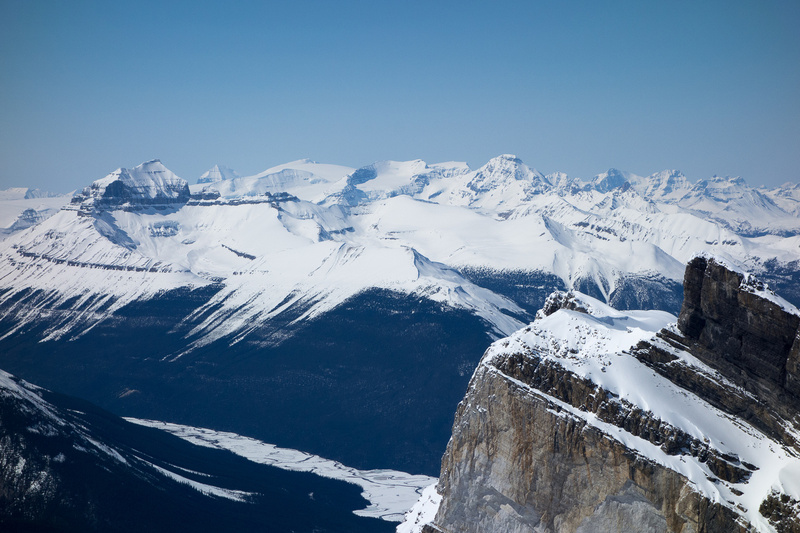 Looking west and north the two major river valleys include Glacier Lake and the Athabasca River valley. Erasmus has only been ascended two or three times. The Lyells are another set of 11,000ers on my hit list. 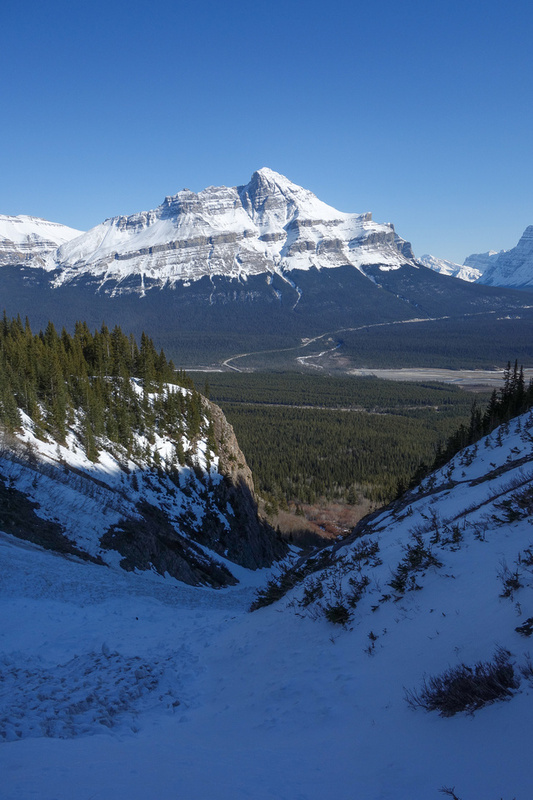 Bryce peaks out just to the left of Mount Amery. Amery was one of my favorite climbs of 2012. Bryce sound like a fun mountain too. 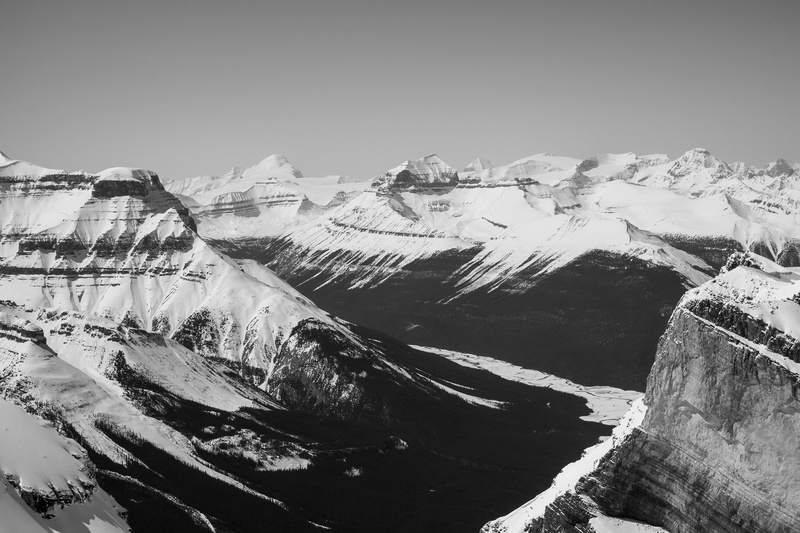 Looking north to the Columbia Icefields. Lion and Lioness to the east. Huge cornices to our right. Heading back down the summit ridge. See the exit col? The only shot I have of the section just above the crevasse. A huge drop down to hwy 93. Steven and Ben come down under the crevasse. The terrain is much steeper than it looks on this photo since I'm looking up it. This give some idea of the hard-slope exposure down the west face of Wilson. Cirrus at left with Stewart at right. Cirrus now at right with Coleman in front. 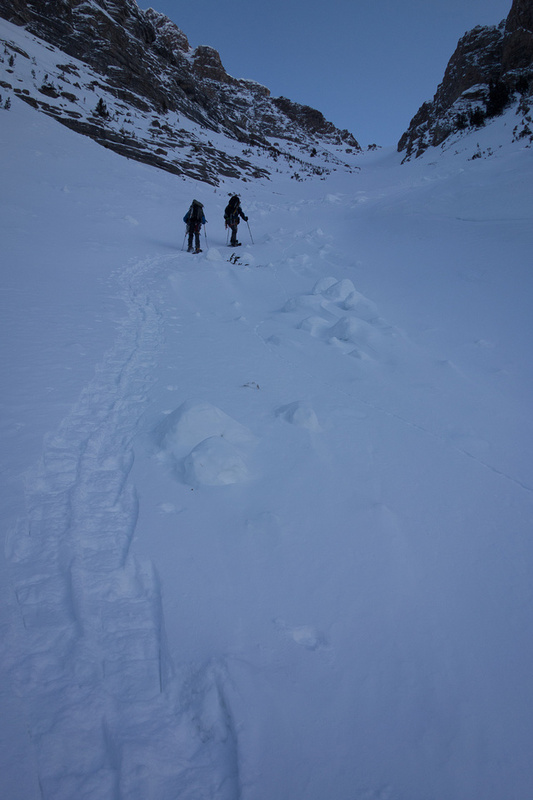 Note the cornice failure that we triggered en route from the summit above. Descent views over the shortcut col and east ridge down hwy #93. Click for full size. Seracs on the east ridge of Wilson. Eric follows us down - the ropes are off now. Exposed snow slopes to the col are still in shadow - this is what makes them a viable route instead of a two day trip up Rampart Creek. Looking back at Eric as I re-ascend to the shortcut col.
Steven and Ben looking cheery at the cold / windy col! Steep south facing slopes await us - but at least the sun has been off for a while now. Looking back up the steepest part of the avy slope - note Eric coming down. Thank goodness we're back in shadow on snow that's firming up again. Turning left to rejoin the ascent gully back to the trees. 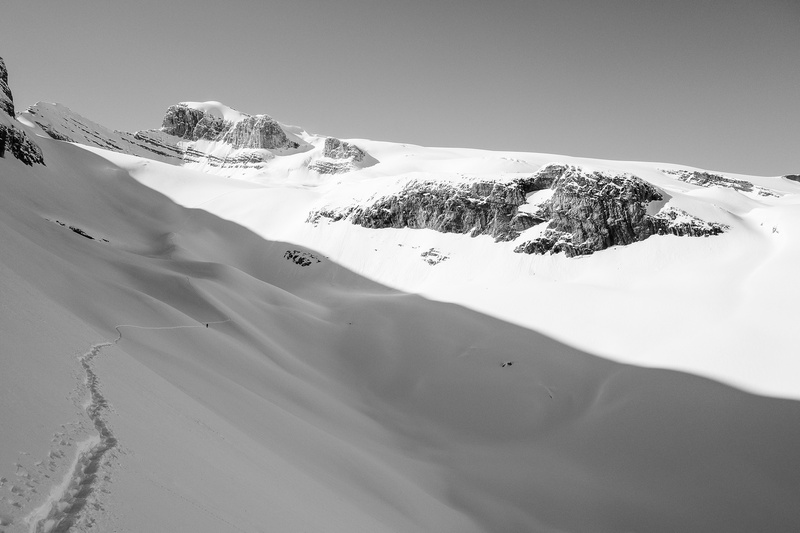 These sort of avy chunks would squish you like a bug. Joining the single gully down low. This is what the left branch looks like from the main one from below. 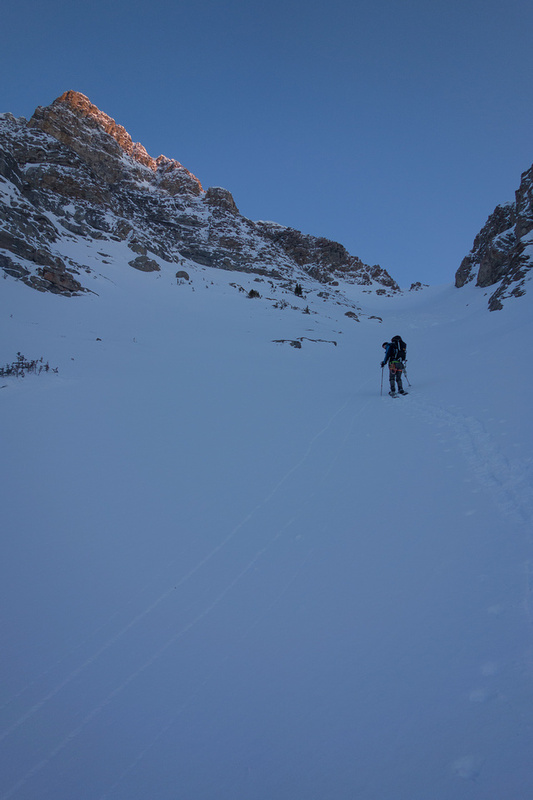 The shadows are lengthening at the end of a perfect day in the hills as we exit the finaly avalanche gully before plunging back into the 'pleasant' treed section. Looking back up the gully from near the bottom. Steve exits the gully, this is looking back up it. Done!! 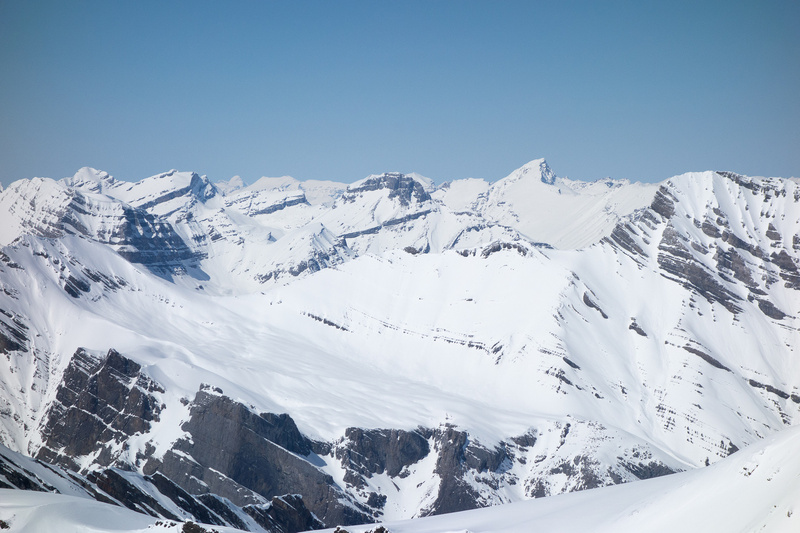 The two avalanche gullies clearly visible in the background. You want the left one higher up.